The Santa Cruz County Horsemen's Association was organized in October of 1944 by a small group headed by Margaret Dellamonica, an ardent horsewoman and owner-trainer of racing blood. Previous horse associations had been abandoned due to World War II.Articles of incorporation were filed Jan. 9, 1945, and Charles Parker was elected as the first president. The objectives of the organization were to perpetuate interest in all horse activities, create and maintain a better knowledge and understanding between the human and equine families, and develop and maintain a county-wide trails system. Within their first three years the Horsemen's Association formed a 50 member Santa Cruz County Sheriff's Posse with Sam Coffee as president and a 30 member Junior Horsemen's Association presided over by Robert Hart. Activities were originally held at Wagner Grove in De LaVeaga Park, a parcel they had leased from the city council in 1945. They hoped to build a permanent clubhouse and have facilities for members, guests and their horses. Sometime after 1946 the Horsemen's Association moved to their present location on Graham Hill Road. At that time it was known as the Pasatiempo Polo Grounds (a polo grounds and steeplechase course were in existence) and Turner Flats. They were able to rent these grounds until April 1950, at which time they obtained a lease. In 1955 a lease with the Cowell Trust Estate called for sharing the grounds with the Santa Cruz Sheriff's Posse and the San Lorenzo Valley Horsemen's Association. The Graham Hill property was originally vacant except for a track which was used by trotting ponies. 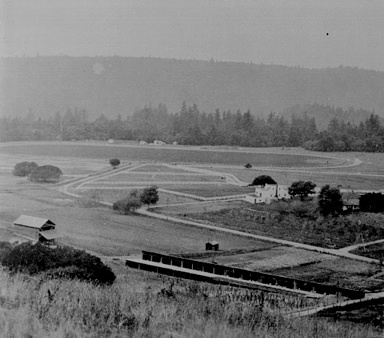 (The ponies also used a track near the old Scotts Valley Airport.) All the existing structures and fences had been constructed by the participating clubs since 1946. The original arena was completed in 1954 and served until 1988 when it was replaced with a pipe corral arena. Prior to 1954, shows were held at de LaVeaga or Harvey West Parks, or at private stables.Our clubhouse was an old cabinet shop in Capitola, which was moved to the grounds in 1956, a feat which took 3 days. A quonset hut was obtained for storage and erected on the property in 1969. The land was originally a large hay field extending to the entrance of Henry Cowell State Park. The forest began encroaching on the fields in the 60's. 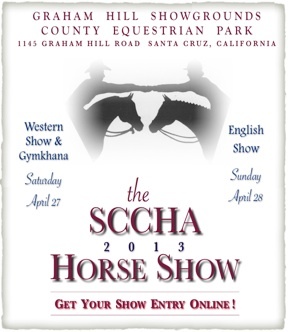 The 40's, 50's and 60's were eras of big horse shows, annual shows having begun in 1945. There were as many as300 participants and 1000 to 2000 spectators who paid admission fees of $2 per car. There were box seats for viewers and a wet bar was available. These shows were often preceded by a parade in Santa Cruz. A parade grand marshal was often featured; this was either a movie star or a leading businessman in the community. Some of the grand marshals were film stars James Craig, Rory Calhoun and James Brolin. The shows were two day events with a combination of gymkhana and traditional English and western classes. Additional classes included color guard competitions, pony harness races, cowboy races (quarter mile races which were canceled in 1962 when two youngsters who were competing lost control of their horses and were injured), classes for gaited horses, shetland pony trotting races and quarter horse races. Special noontime attractions included exhibitions by the California Centaurs and the Hoofbeats (drill teams), trick horses and parades. Stanley Phillips of Watsonville used to bring his horse and buggy and drive in the shows Grand Entry with the Miss California contestants who would present the ribbons. Often these shows would be covered by Channel 8. Besides the traditional horse show, three day "Olympic Training Events" were held, utilizing the excellent outside jump course. Tryouts for the junior Olympics were held at Graham Hill in the 40's and 50's. The Santa Cruz Pleasure Horse Competition was a popular event from 1954 to 1964. Horses were judged on all aspects of handling from trailer loading, to saddling and bridling, obstacles and rail work, and even conformation and ability to work in groups. 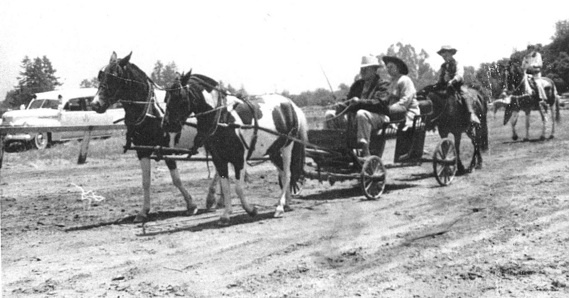 1962 saw the first Horse Fair which was held in conjunction with the Santa Cruz County Fair. Part of the Miss California Pageant until 1963 was a parade held on Pacific Avenue in which the Horsemen's Association was featured. Another local parade in which the organization participated was the annual Scotts Valley Pioneer Days Parade. There was also a annual ride from Graham Hill to Crazy Horse Canyon and then on to the California Rodeo Grounds in Salinas. Two long standing junior groups have been sponsored by the club, the Santa Cruz County Junior Horsemen's Association and the Color Guard, which has appeared at the County Fair, local parades and other events. During the 60's the club sponsored the Hoof Beats, a drill team comprised of 30 junior riders. They worked under Joyce English and their performances included appearances at the Cow Palace (Grand Nationals). In 1956 Hermann and Elizabeth Friedlaender founded the Pony Club's first west coast chapter. The Pony Club is a national organization run by volunteers whose goals are to teach riding and care of the horse or pony to young people. The Pony Club has used Graham Hill Showgrounds for its weekly meetings and annual camp rally since its inception. The grounds have also been shared with the California Pony Harness Racing Association, the Black Mountain horse club, a polo club, and most recently a polocross team. A string of rental horses was run from the grounds by Sue Mason, a charter member of the San Lorenzo Horsemen, from 1963 to 1965. In the 60's the Sheriffs Posse ended its affiliation with the purchase of their own grounds. In addition to the horse clubs, the grounds were shared for a period of time with the Pacific Coast Aggregates fraternal order. The grounds have been available for activities held by both the Boy Scouts and Girl Scouts of America, Camp Fire Girls, 4-H groups, Little League, dog clubs, local churches and other horse clubs. Horsemanship clinics have been held for the Girl Scouts, the Scotts Valley school district students and Santa Cruz High School. The grounds have also been the location of Circus Vargas and a charity circus sponsored by the Scotts Valley Exchange Club to fund prevention of child abuse. Rodeos were also staged on the grounds to raise funds for tours by the San Lorenzo Valley High School wrestling team. The grounds were used in the movie The Romance of Rosie Ridge, a civil war movie starring John Payne, and a television commercial. During the years that the grounds were leased by the two main clubs, SCCHA and SLVHA, a third body made up of 3 members of each club, known as the Board of Governors, oversaw the maintenance and bookings of the grounds. They held a monthly gymkhana playday to defray expenses, along with occasionally assessing the individual clubs. Each club held it's own activities, including meetings, trail rides, BBQs, family campouts, poker rides, clinics, and an annual two day horse show. In addition to having their own shows, the clubs would join forces to stage another two day show and special events, the most famous being the Graham Hill Trail Ride which took place between 1968 and 1972. The object of the ride was to cover the 12 mile course with the least penalties and in the shortest time while negotiating obstacles such as barnyards with chickens, pigs and goats, a running motorcycle, a downhill slide (200' at a 45 degree angle), the famous swimming hole, and some more traditional obstacles. The mid to late 70's was a period of great unrest for the clubs due to the attempts by the Cowell Foundation to sell the grounds. In Oct 1976, the club was given a 60 day eviction notice. With the assistance of Councilman Ed Borovitz, they were able to remain on the grounds. Among the proposals for development of the grounds were a housing subdivision by the Santa Clara based contractor, "Ponderosa", a church and school by the Christian Life Center, and the "Bridle Paths Estates" subdivision by Stekoll corporation. During these times the clubs worked separately and together with the supervisors, to seek a purchase by County Parks or State Parks, or various land trusts, to arrange a land swap with Cowell, and even to purchase a portion of the land themselves. The purchase attempt received the most attention, with the greatest efforts put into raising funds. Pledges were solicited from friends, neighbors and fellow horsemen. The biggest effort was the December 5, 1976 Doobie Brothers concert held on the grounds to a capacity audience of 5000 dancing rock and roll fans. This netted an overwhelming headache for the planners, Dave Nielson and Sue Warner, in seeing to security, traffic control, litter, complaints of noise from neighbors as far away as four miles, as well as $18,000. A second benefit dance and raffle were held in November of 1977. The performers were Mo Bandy, Tom Bresh and Danny Rogers. Raffle prizes included a horse trailer, color TV, roping saddle and Stubben English saddle. 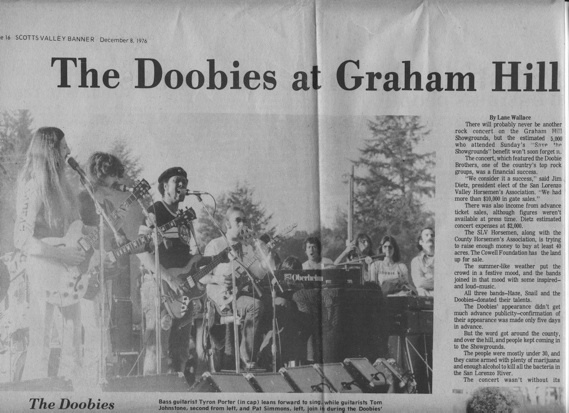 The permit for the Doobie Brothers concert at Graham Hill was granted on a one-time-only basis, so the second benefit was held at the Cocoanut Grove. Unfortunately, due to many circumstances, the clubs lost $6000 on this benefit. But, during all this the developers were meeting with equally poor luck before the planning commissions and by 1980 the developers had all withdrawn and the clubs returned to a state of relative complacency, even though their lease was to remain on a month-to-month basis. One of the results of stress endured by the clubs during these years was a merger which had begun in 1977 and was finalized in 1980 with the absorption of the San Lorenzo Valley Horsemen's club by the Santa Cruz County Horsemen's Association. A new logo was created during this time by artist Gerry Bartlett. She had originally created the logo for Dave Neilson's barn, and he in turn donated it to the club. The gas crises of the mid 70's had an effect an the horse community as fewer people were willing to trailer to the big shows and the Graham Hill Trail Ride found competition with NATRC rides. Horseshows, gymkhanas, clinics, trail rides, bbqs and campout were still held, but attendance did not match that of earlier days. The club has three memorial trophies which it awards at its annual shows. The Fred Wagner Perpetual Memorial Trophy is awarded to the most outstanding junior, who has been most active and who has done the most service for the club. Fred was a founding life member and local blacksmith. The John Shoemaker Memorial Trophy is presented to the winner of the open jumper class. John was a local trainer and judge. The Doug Schmidt Memorial Trophy is awarded to the open western pleasure winner. Doug was a fire chief in Soquel and donated countless hours to maintenance of the club grounds and assistance at club events. In the 1940's members actively worked on routing the State Riding and Hiking Trails through Santa Cruz County. (Authorized by Assembly Bill 1140 and Senate Bill 630) They planned for the trail to enter the county in the area known as Little Basin and proceed south, through Soquel, and on to Watsonville. The mid 70's saw a renewed focus on trail preservation, acquisition and maintenance. The club lobbied to open the Saratoga Toll Road to the public, for the acquisition of Quail Hollow Ranch by the county parks system, to preserve access to the beaches, to open Wilder State Ranch to the public and to expand the trail system in Fall Creek State Park. They obtained legal access to the trails on San Lorenzo Water District land in Zayante, and worked to acquire a trail system linking Cowell, Quail Hollow, Fall Creek, Big Basin and Wilder Parks. They mapped the county riding and hiking trails for use by the city planners. Although most of the money made at events went back into the rental and maintenance of the grounds, the Horsemen's Association has had the opportunity to donate to multiple charities and causes. The proceeds of a Ride for Research and a horse show (a show in conjunction with a 4-H club) were donated to the Morris Animal Foundation and their research on equine diseases. The annual endurance ride, which began in 1983 has its proceeds earmarked for trail maintenance and acquisition. Cash donations have been made to Henry Cowell and Wilder Ranch State Parks. Matched funds with the Sempervirens Club enabled the purchase a "trail machine" (a special tractor for making trails) for the Santa Cruz Mountain District of the State Parks. The donation of materials for trail improvements and the volunteering of time and labor, in particular during the annual State Wide Trail Days, has been a regular part of club participation. The Horsemen's Association has actively helped youth groups it has sponsored over the years: its own junior horse club, drill team and color guard, and the Santa Cruz Chapter of the Pony-Club. They have also donated to the California State Horsemastership program which provides scholarships to outstanding young horsepersons. Other recipients of donations have included the Salvation Army (Christmas toys), Visiting Nurses, Alisa Rush Burn Foundation, County Fair, and many others. The River Crest-Dragon Slayers, a group which provides riding therapy for the disabled, received financial support for a number of years, in addition to member's assistance in putting on their annual fundraising horseshow. The club has offered the community multiple free or low cost clinics and speakers to help participants acquire better riding and training skills, and knowledge about the care and handling of horses. During the Lexington fire of 1985 the club was able to oversee the evacuation, feeding and stabling of 150 horses, as well as many other animals. They were again able to come to the aid of the community when Felton stables were flooded in 1986. As the oldest horse club in Santa Cruz County and the second oldest in the state of California, the Santa Cruz County Horsemen's Association has continued to ride the changes of time. With the 1997 purchase of the Cowell Foundation land by Standard Pacific Corporation, the Graham Hill Showgrounds down-sized to a 20 acre portion of the original tract. Between 1997 and 2001, the club operated the showgrounds under unprecedented limitations due to its new landlord, citing liability concerns surrounding events and use by non-members. For a time, they were unable to continue many of the activities of the past. The old clubhouse stood outside the 20 acre parcel and had to be torn down. In June 2001, however, the Graham Hill Showgrounds officially became a County Equestrian Park, making its 20 acres an independent parcel and opening the door for showgrounds events to grow in number and popularity. The first decade of the new milenium enthusiastically revived activities from the past to blend with the very new. After years of planning and interfacing with County Planning and other government agencies, we finally broke gound on our clubhouse in early 2007. With a tremendous amount of volunteer effort to complete and add all the final touches in 2009, we have ourselves an awesome new home. Years of saving for this effort and the generosity from so many contributing funds specifically to build a new clubhouse got it done and paid for. The club also got busy early in the decade to re-establish sponsorship of English, Western and Gaited Horse Shows, which have been very well attended and great fun. Combining the Western Horse Show with a Play Day added a new twist of competition to the shows. We also made it possible to occasionally bring in cattle to offer members the opportunity to do some cow horse work, created a new Banana Slug Trail Trialevent, and continued to provide the always successful Fireworks Endurance Ride. An annual Spook Fest took hold on or near Halloween to teach owners and their horses to learn how to desensitize to scary things in the modern world - like blowing tarps, helium balloons, and loud motorclycles. And an annual Saddle up for St Jude Ride in Swanton became very popular as a means for riders to raise funds for St Jude Children's Hospital (thanks especially to Bud & Emma McCrary who provided a great venue and trails). The club also played a key role in evacuating horses during several local forest fires in 2008 (Summit, Martin and Trabing Fires); 2009 (Lockheed Fire); and 2016 (Loma Fire) . During these dry years, fires spread quickly through a number of mountainous areas in Santa Cruz County. Organized by Equine Evac and County Animal Services, our members provided a huge assist in evacuating hundreds of horses and other animals. Many of our members went through OES training to be able to safely and legally drive their rigs into evacuating areas to assist in these efforts. The Showgrounds again housed equine refugees during some of the fires. Recent improvements for club members include a new outdoor kitchen use area for horsecampers and a new arena to replace our smaller one. On the horizon the club is planning for a new equipment building and constructing a welcome kiosk complete with solar lights and laden with information about the Showgrounds, Campground, and local trails. SCCHA continues to provide maintenance of our local trails, host interesting guest speakers at our Membership Meetings as well as clinics and seminars to help educate club members and the community on how to care, work with, and enjoy equine friends.